A heightened focus on student access and equity is a lens that I carry with me as a woman of color who is also an immigrant to this country. I joined CenterPoint as a content specialist on the math team in the summer of 2017. Prior to this role, I focused on accessibility policy and worked to ensure large-scale assessments were accessible and fair for every student. Because of my experiences, as opportunities came up to bring a greater focus and awareness to issues of access and equity at this organization, I naturally wanted to be a part of it. Over the last year and a half, CenterPoint has taken steps to raise awareness among members of our team so that we consider the importance of equity not only in the products and services we deliver, but also in our daily interactions. While there is still more work to do, here are five steps that we have taken so far to build a more equity-minded workplace community. In September 2017, a small team of staff came together to review our organization values to ensure that they aligned with our organization’s vision and mission, part of which is to promote educational equity. We looked at examples of core values at other companies and had several discussions to narrow down a revised set of values. Those values, which define how we operate as an organization, include three focused specifically on diversity, equity, and inclusion: Honor Diversity, Think Big, and Advance Equity. When introducing the new set of values to our entire staff, we prepared a worksheet (yes, some of us are former classroom teachers 😊) and led a simple activity where given an example of an employee living out a value, staff members would identify which CenterPoint value is being demonstrated. 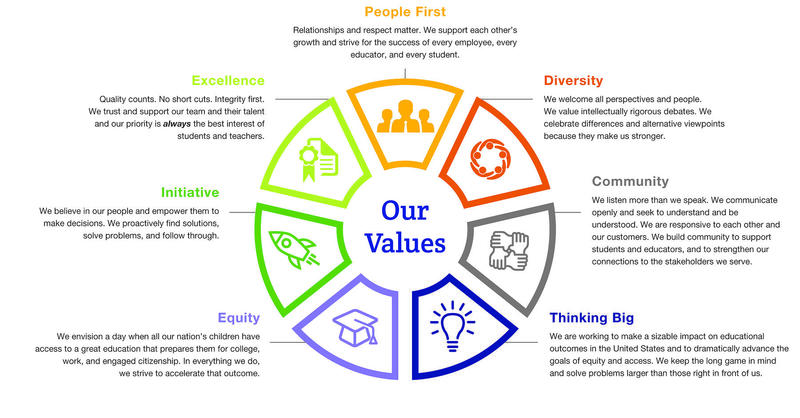 The revision of our core values was one small, yet concrete step in raising our team’s commitment to celebrating diversity and advancing equity. At the start of 2018, our CEO launched a Diversity, Equity, and Inclusion (DEI) program and led a discussion series to (a) explore diverse perspectives from an anti-bias stance and with a bent towards social justice, and (b) help inspire us to be agents of change in our own communities and lives. While somewhat unusual to have these types of discussions in the workplace, I appreciated CenterPoint’s commitment to living our values and enjoyed the opportunity to learn about and build deeper connections with my colleagues. Another success of the discussions is that they have created space to talk about critical issues such as race, gender, and class, which matter to the work we do and also matter to me personally. Read more about the DEI program, including a list of the materials we used in the early months of the program and reflections from our CEO, Laura, in this blog post. In the Fall of 2018, I had the opportunity, along with a small group of my colleagues, to participate in equity-focused workshops funded by the Hewlett Foundation through their DEI Boost Program and led by external partners to explore what it means to be a leader for educational equity. In a results-oriented culture, especially when I find myself so immersed in the work, it’s important to continually come back to why the work matters. The training gave me the chance to take a step back from my projects, engage in deep, personal reflection, and consider how well my intentions (that is, in promoting educational equity) align with my actions. The two days spent with a group of mission-driven, education non-profit leaders allowed me and our small team to take stock of how well our organization was doing in terms of advancing equity in our work and in our own spheres of influence. Yes, we have processes in place to ensure that our products are accessible to and inclusive of the widest range of students possible. Yes, I am clear on the role I play in ensuring that our content does not unfairly advantage or disadvantage any student population. But what else could I be doing? What about my colleagues who did not get to attend this training? And what about the organization as a whole? Our small group left those workshops with frameworks and tools that we could take back to the entire team. We also gained a renewed energy to identify and solve our biggest equity challenges. As eager as we were for creating a strategic plan around our DEI work that connected to our work externally, we agreed that we wanted to continue the conversations internally with the entire staff first. In November 2018, we formed a diversity, equity, inclusion (DEI) design team, whose primary objective is to ensure DEI issues were a continued focus of our work, and to give all staff members opportunities to examine the influence of these ideals in the workplace. Then, at our 2019 All-Staff Kick-Off Meeting, with the support of our executive leadership, we introduced the DEI design team, invited anyone interested to participate, and our CEO announced that one of our organization’s 2019 priorities was to deepen our DEI work. The first event the DEI design team planned included a set of DEI-focused sessions at a recent organization-wide retreat. As a design team, we understood that if we want to eventually engage with teachers and clients about issues of diversity, equity and inclusion in education, we first had to get every single person on our team comfortable not only thinking about these issues but also talking about them. Out loud. With each other. So we planned a series of activities designed to get people talking, the first of which centered on our individual identities. Then digging deeper, we provided time for each person to reflect on and consider what “equity” means to them and why advancing equity was personally important, given his or her individual experiences. Eventually, the personal reflections led to each member of our team bravely sharing his or her equity why with others in the room. Since the all-staff retreat, the DEI design team is focusing on collecting baseline data to gain a better picture of how we are doing as an organization on our DEI efforts, including the evaluation of organization policies, practices, and staff experiences. The data will help us better understand our needs as an organization. CenterPoint is also participating in a new Gates Initiative “Engage DEI” to further build our internal capacity in our DEI efforts.